Orange County Executive Steven M. Neuhaus signed legislation on March 1 enacting the so-called social host law in Orange County. The law is aimed at deterring minors from consuming alcoholic beverages by holding anyone 18 years of age or older responsible when they permit the consumption of alcoholic beverages by minors on premises. The Orange County Legislature unanimously voted to pass a social host law on Feb. 4. The legislation was spearheaded by the tragic death of volunteer firefighter Jason Speights, who tried to break up a fight at a house party in the town of Crawford on Jan. 1. State police are tracking possible suspects. 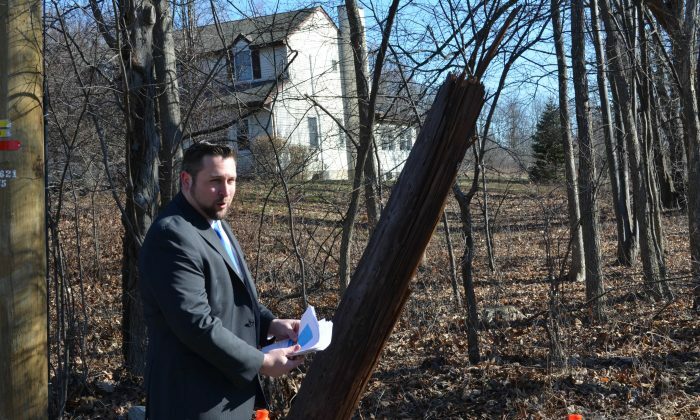 The Wallkill Town Board passed a law on Feb. 25 requiring utilities to remove so-called zombie utility poles before a town-enforced deadline once a new pole is set up alongside the old one, reported the Times Herald Record. The town has identified 546 duplicate utility poles lining town roadways. Supervisor Dan Depew has said the aging poles are a menace, just waiting to cause power outages, interrupt communications or block roads. A U.S. Military Academy instructor was found dead on Feb. 28 while off-post, according to the Atlantic City Police Department in New Jersey. Although an investigation is underway, there is no indication of foul play at this time. Maj. Benjamin Recla, 34, was assigned to the Department of Civil and Mechanical Engineering and served as an officer representative for the West Point Flying Team. Recla graduated from the academy in 2004 and was commissioned as a second lieutenant in the aviation branch. He was assigned previously to the 1st Cavalry Division at Fort Hood, Texas, and served multiple deployments in support of Operation Iraqi Freedom. Attorney General Eric T. Schneiderman announced on Feb. 26 the conviction of Tyrone “Reece” Lee, 29, for running an identity-theft ring that stole over $457,000 from customers of Wachovia Bank (now Wells Fargo) in Newburgh. Lee was found guilty of grand larceny and identity theft. Lee, who is already in jail for a similar scheme in Westchester County, faces up to 20 years in prison. “This defendant with the help of his co-conspirator penetrated the security of the banks that we depend upon for the safety of our finances,” said New York State Department of Financial Services Acting Superintendent Maria Vullo. Lee’s accomplice, Nadia Figueroa who was hired as a bank teller, recorded telephone calls of Lee impersonating a Wachovia customer, and a text message exchanged between Lee and Figueroa comparing the fraud detection procedures of Wachovia to that of Chase Bank. Customers at ShopRite stores in the county joined the efforts of stores throughout the MidHudson region to present $150,000 to Maria Fareri Children’s Hospital, reported The Chronicle on Feb. 24. Customers could donate at checkout. ShopRite also hosted in-store activities and events in November 2015 to raise funds. A representative from the ShopRite in Middletown was on hand to present the donation, which will help support the hospital’s efforts to provide lifesaving and life-changing care to thousands of local children each year, including those in need of open heart surgery, brain surgery, cancer treatment, trauma and burn care, organ transplants, and more. The city council late last year voted to conduct a search as current Manager Michael Ciaravino’s contract expires in May, reported the MidHudsonNews. Mayor Judy Kennedy would like to end the search for a new Newburgh city manager. Two former council members who voted for the search stated publicly they wanted Ciaravino out. The mayor said the council does not have the votes to remove the city manager. “The bottom line is nobody has the five votes needed to do anything so the status quo is the status quo,” the mayor told MidHudsonNews.com. “They can search all day long, they can search for the next two years if they want to search, but until they have some votes to hire somebody, we are where we are.” Ciaravino will continue on a month-by-month basis after his contract expires. Rep. Sean Patrick Maloney announced on Feb. 25 that his office secured a $1.79 million federal investment for Early Learning and Head Start programs provided by the Regional Economic Community Action Program (RECAP), an Orange County community based organization. “Education is one of the most successful anti-poverty programs available to families.” said Charles Quinn CEO of RECAP. “RECAP truly believes that education is a pathway out of poverty and as Orange County’s anti-poverty program, we are proud to provide that pathway to our community’s children and their families.” Last year, Maloney announced an investment of $1.04 million to Head Start and its RECAP affiliate in Orange County. A dog abandoned on Route 209 near Cuddebackville on Feb. 24 was rescued by a passing motorist and taken to the Humane Society of Deerpark/Port Jervis for emergency care. The dog has since died. Deerpark police posted graphic photos of an emaciated pet, which appeared close to death and have asked the public for information leading to the owner. According to the Deerpark Police Department’s Facebook page, the dog was described as “a white female Pit Bull terrier. At the time of admission the dog weighed 25 pounds and was severely underweight. In addition, her body temperature was extremely low. Photographs of the dog suggest a collar was recently removed from her neck.” The vet giving emergency care thought the dog was about two years old and had not been fed for two weeks. “She cannot stand on her own and she is not alert. She is also experiencing bloody diarrhea,” he said on Feb.24. The Deerpark Police Facebook page has been flooded with support, sympathy, and outrage over the abuse. With a grant secured in 2014 by Port City Chief of Police William Worden, a project to install concrete sidewalks on East Main Street continues, reported the Pike Dispatch. Consultant for the project Ted Otteni briefed the Common Council on Feb. 21 on the $900,000 streetscape project designed to make sidewalks more handicapped accessible and safer for children. The new sidewalks replace concrete, asphalt, and bluestone sidewalks on East Main Street from the Middle School, to Kingston Avenue and to Hamilton Avenue. From Kingston Street and the Hamilton Avenue intersection, new sidewalks are planned to the Port Jervis Auto Mall and to Anna S. Kuhl Elementary School. The federal and state Safe School Street grant covers 80 percent of the cost.